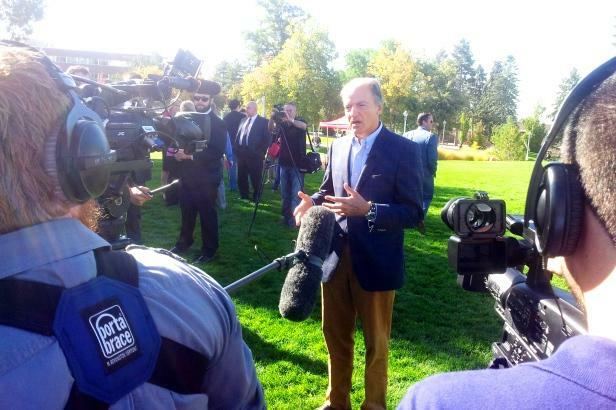 Pierre Lassonde, MBA alum of the David Eccles School of Business at the University of Utah, was on hand for the groundbreaking on the Lassonde Studios just east of the Carolyn Tanner Irish Humanities Building. The University of Utah celebrated the groundbreaking for the Lassonde Studios on the campus’s east side Friday. The building will include resident space for more than 400 students. A massive open garage space designed for innovation and collaboration will be for all students at the U. Mining magnate Pierre Lassonde is a Quebec, Canada native and a University MBA alumnus. He says this creative space would not be possible at a long list of Ivy League schools or MIT because the structure regulations there are too ridged. “It’s possible here because the president said like you know, ‘I share this vision, I want it to happen, you guys work together but make it happen.’ And that is one of the key, key components of the success of the Lassonde Studios,” says Lassonde. Artists rendering of The Lassonde Studios. Troy D ‘Ambrosio is the executive director of the Lassonde Entrepreneur Institute. He says a very unique interdisciplinary group at the U has come together because it’s focused on the students. “So we want to either help them start their own company or get a better education and get a better job and everybody is into that and knows that’s their mission,” D' Ambrosio says. David Toledo is a former University material sciences engineer and entrepreneur. He is co-founder of Power Practical which created the Power Pot. 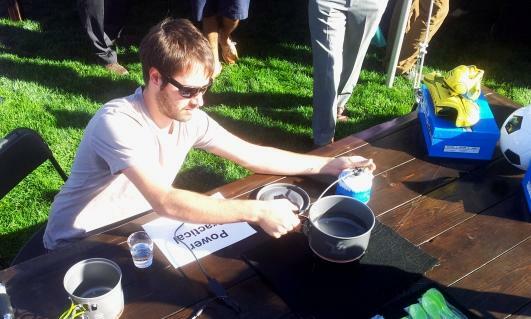 It’s camping cookware that generates electricity. He says he learned to have failures early and often because the stakes are lower. David Toledo, co-founder of Power Practical, demonstrates the Power Pot at the groundbreaking event for the Lassonde Studios. “It’s kind of like you can talk about doing something or you can do it and the Lassonde Center is all about doing things,” says Toledo. Completion of the 148,000 square-foot studios facility is planned for Fall of 2016 at a total cost of $45-million dollars. Pierre Lassonde added a $12-million donation to the $13-million he’s donated to the founding of the Institute. The remainder of the building costs will be paid for by other donations and rent from students living there. NOTE: This story has been edited from its original posting Friday to clarify that MIT is not an Ivy League Institution.